Gugulethu is a township 15 km away from Cape Town. The name is a contraction of igugu lethu, which is Xhosa for 'Our Pride'. This township was established along with Nyanga in the 1960's. The Group Areas Act (1950) reinforced the policy of land dispossession and segregation in South Africa. In accordance with the Act, many Africans, Coloured and Indian people from inner city areas were relocated to new suburbs, often far from their places of work. Africans were the first group of people to be subjected to forced relocation. The Native (Urban Areas) Act of 1923 provided that all Africans, other than those exempted, had to live in a location. As a result, townships like Gugulethu, Nyanga and Langa (in the Western Cape) emerged. Gugulethu Township is located on the Cape Flats and situated 18km south-east of Cape Town in the Western Cape Province. The name is Xhosa for ‘our pride’. The township was established in 1958 and was originally named Nyanga West. Roads, sewers, water and drainage systems were completed by December in the same year. The Cape Town City Council (CTCC) erected prefabricated galvanized iron sheds housing four families each, who, if eligible, were to be moved into permanent housing as it became available. The first two families were apparently moved from Windermere to the new camp on 19 December 1958. Gugulethu is also known for the incident involving the ‘Gugulethu seven’. Seven young men who were members of uMkhonto weSizwe (MK), the armed wing of the African National Congress (ANC), were ambushed and killed by the South African security forces on the morning of March 3rd, 1986. 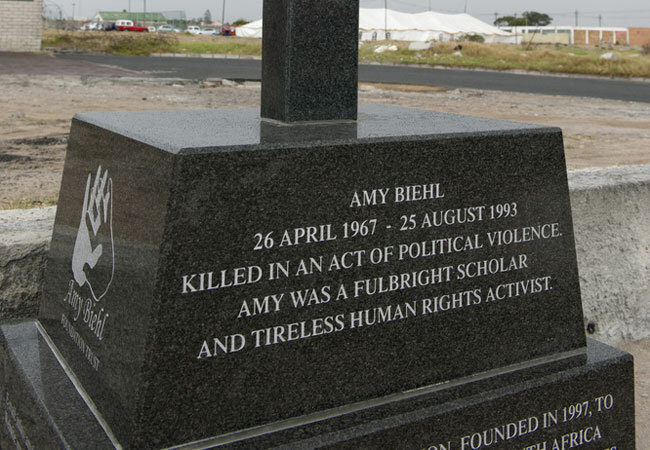 The Gugulethu Seven Memorial was built to commemorate the life and death of those activists. Click here to read more on Gugulethu Seven. ‘Gugs’, as Gugulethu is often called, was established to accommodate the many migrant workers who moved to Cape Town from rural Transkei or the homelands in the Eastern Cape Province. The township also absorbed some of the inhabitants of Langa when it became overcrowded, having been the only Black residential area for Cape Town at the time. Transkei,one of the ten homelands, was created in terms of the Bantustan policy. Its chief purpose was to assign Black citizens to a ‘homeland’ according to their ethnic identities. The policy was initiated by the Apartheid government who sought to turn South Africa into a White republic. In this way the Bantustan policy paved the way for forced removals. Families were not permitted to own their barrack-like homes in Gugulethu, as these were intended to be single quarters in future. Many families shared a single bed as the homes were too small to fit in anything else. Townships like Guguletu and Nyanga came under more pressure as more people came to Cape Town in search of work. Township residents experienced discrimination on a daily basis. Gugulethu residents included Africans forcibly moved from Windermere when it was declared a Coloured area. An estimated number of 735 families were moved from Windermere to Gugulethu. Windermere is an urban area in the vicinity of Lansdowne, located south-east of Athlone in Cape Town. By 1960 the number of people evicted from Windermere had increased to 3128 families - including those from Retreat and Athlone. In November 1961, 2 000 Steenberg residents who were threatened with removal signed a petition protesting forced removals to Gugulethu. By October 1963 Gugulethu’s population had expanded to over 27,000 inhabitants.